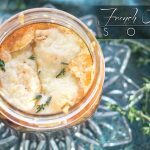 January is national soup month, this Primal French Onion Soup will warm you up and is gluten and grain free! What should I write about? January is here, 2017, Happy New Year! With another year having arrived I find that reflection on the last year needs to take place, as well as goals and anticipation for the new year ahead. But, I am going to make gluten-free tacos for dinner tonight, and well… tacos. 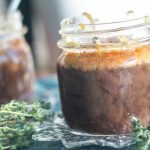 So instead I'll keep it short and chat a bit about primal-izing my classic French Onion Soup recipe. 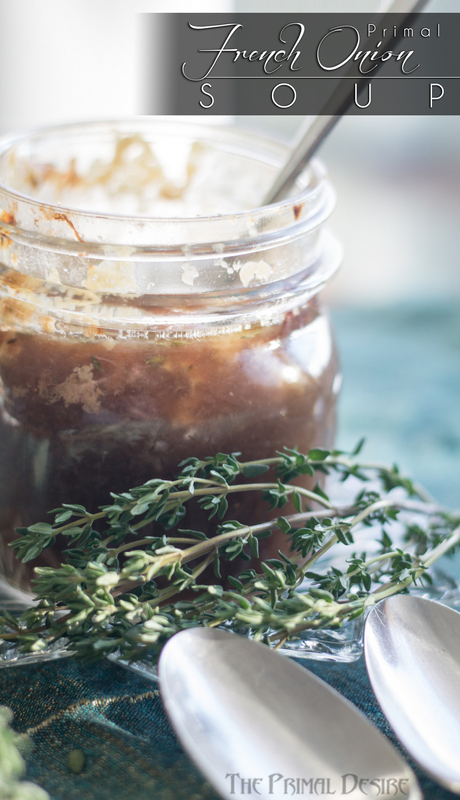 French Onion Soup is rich and delicious, piping hot with melty cheese goodness. Unfortunately, this good old classic always sends me looking for a washroom. 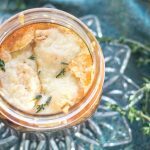 I was craving french onion soup without the intestinal distress, debating on what I could do or make or substitute the crouton with. I was literally (actually) going to sleep and waking up with French Onion soup on my mind. Now if you can't tolerate cheese or dairy, this may not the recipe for you. Of course one could have the straight up onion broth and it would be delicious, but not the same. I had grand plans to make batches of this soup to pressure can (without cheese), but it never made it that far! 6 batches of recipe testing and all the soup was gone before I had a chance to preserve any! 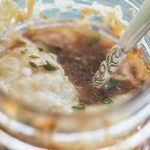 I was not always a fan of French Onion Soup, and hated onions as a kid, no doubt a fight my Mom didn't want to start. Can you imagine, I was a stubborn and strong-willed child? I know that might be hard to believe… (haha). 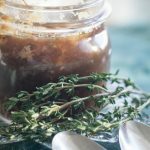 As a teenager, I softened on my onion stance and tried French Onion soup. I remember the day clearly, almost 19 and had all 4 of my wisdom teeth extracted less than a week before. My mouth was still packed with cotton covering stitches in all 4 corners of my mouth, and I HAD to go out with my girlfriend for soup. See above about being strong willed. The restaurant we picked was out of the soup of the day, and French Onion was my only option. I ended up carefully eating the broth avoiding the cheese and croutons. Trying my hardest to not chew: my cheeks, the cotton or my tongue. Really not the best introduction! Now my love of FOS is fully bloomed I have become a French onion snob. 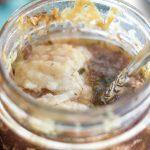 Not too salty, and a complex rich caramel onion flavor is essential, and gluten free of course! 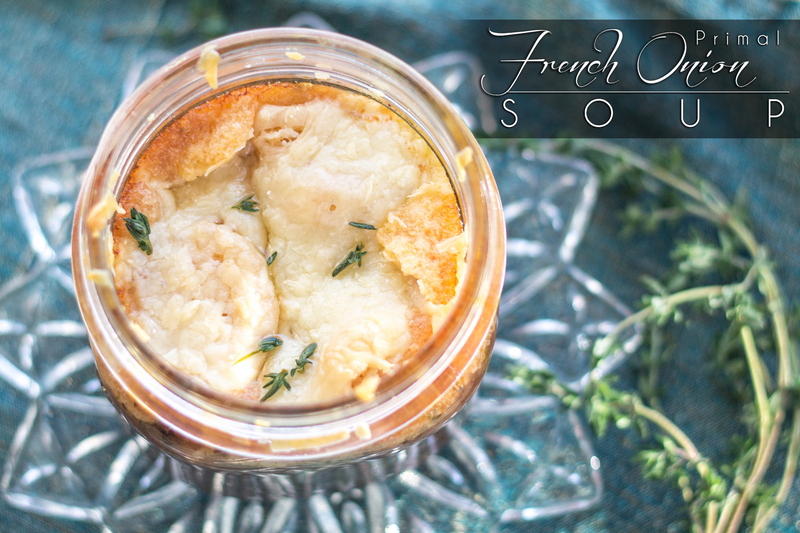 Enjoy our version gluten and grain free Primal French Onion Soup! Melt butter or ghee over medium heat until it bubbles, or foams slightly. Add 1 tsp of the salt and the sliced onions, stir to coat the onions with butter or ghee, cover, and cook for 15 minutes. Add 1 tbsp apple juice. Turn the heat up to medium/high and stir sauteeing or caramelizing the onions, careful not to burn, this will take 45 minutes for the onions to cook down and become golden, caramel in color. Add 1 tbsp cassava flour to make a roux, and 1 cup of broth, stirring to combine. Add rosemary, thyme, and bay leaf, remaining broth salt and pepper, bring to a boil and reduce to a simmer. Add the wine (optional) and continue to simmer for 45-60 minutes. 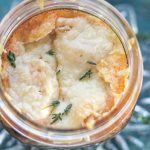 Remove the bay leaf, scoop into oven-safe bowls or wide mouth jars. Float parmesan crisp(s) on the top and sprinkle with cheese, place in the oven for 15 min or till the cheese is melted and golden. Garnish with a sprinkle of dried or fresh thyme. Hi Holley, How many servings is your soup recipe? Hi! It depends on how big the bowls are! I would say 4 to 6 larger servings!